Serafin Cuevas, former Supreme Court magistrate and justice secretary, has passed away. He was 85. The Supreme Court Public Information Office noted in a statement released Monday morning that Cuevas died Sunday night. The cause remains unspecified. A Bacoor, Cavite native, Cuevas served as a magistrate during the term of former President Ferdinand Marcos. He left his position shortly after the dictator’s ouster. He resurfaced a decade later when then-President Joseph Estrada appointed him as justice secretary. More recently, he stood as the spokesperson of resigned Ombudsman Merceditas Gutierrez (her impeachment trial did not proceed because of her resignation). 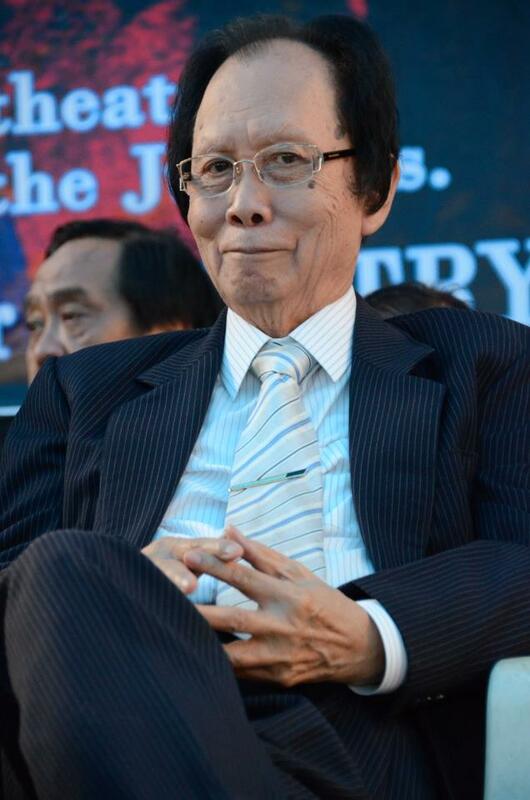 Cuevas also notably served as the lead defense lawyer of ousted Chief Justice Renato Corona. Alongside 2GO Group’s ongoing search and rescue operations, the company is also addressing and containing the oil spill coming from the sunken m/v St. Thomas Aquinas by flying in global oil spill experts to professionally handle the situation in the Lawis Ledge in Talisay, Cebu as part of the company’s commitment to the environment. On Aug. 17, the day after the ship sank, 2GO Group deployed two Malayan towage tugboats at the site to contain an anticipated oil spill. One of the tugboats is properly equipped with machineries, materials and supplies against oil spills such as the 400 meter oil spill boom, including oil skimmer; solvent boom pads to absorb oils from the water surface; 4 bales of booms and pads and drums of chemical dispersants. 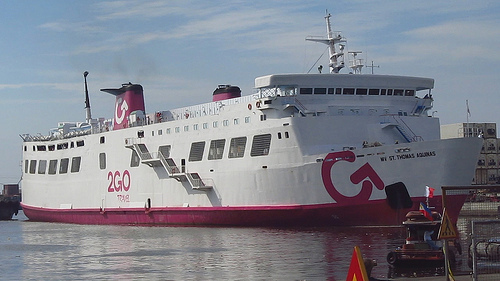 In short, 2GO is taking all steps to contain any possible oil spills from the ship’s sinking. 2GO is taking this pro-active stance to ensure that the St. Thomas Aquinas’ sinking will not aggravate in any way the marine ecosystem of Talisay and other water bodies in Cebu. The ferry had 20,000 liters of diesel fuel and 120,000 liters of bunker or crude fuel in the ship’s fuel tank and 20,000 liters of lube oil that were being used by the engines when it was running. 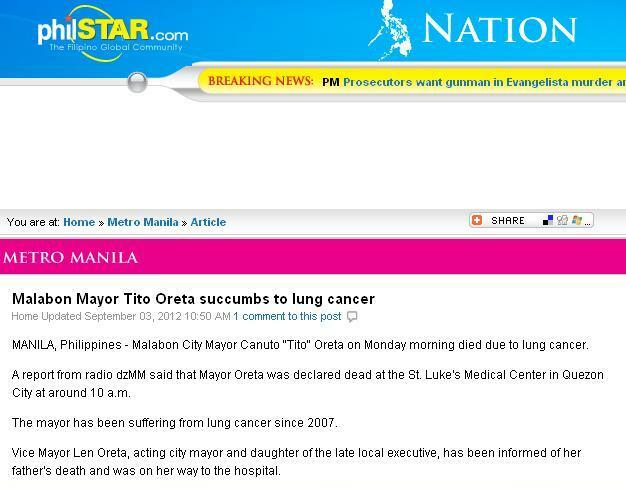 Malabon City Mayor Canuto “Tito” Oreta died of lung cancer Monday morning at the St. Luke’s Medical Center. Oreta, 73, has battled the disease since 2007. He is on his third and last term as mayor. His nephew, Vice Mayor Antolin “Len-len” Oreta III, will officially succeed him in the coming days. The younger Oreta, who will turn 41 on September 16, has served as the acting mayor of the flood-prone city since his now-deceased uncle went on a medical leave early this year. He is the son of former Senator (and presidential aunt) Tessie Aquino-Oreta. First, they initially misspelled the late mayor’s surname as “Ureta” before belatedly correcting it. Secondly, the story says that the Vice Mayor is a woman and that he is a daughter of the elder Oreta. If the article writer and his or her editor bothered to check out the website of the Malabon city government, they would have found out that the Vice Mayor is actually a man (despite his ‘feminine’ nickname) and that he is a nephew of the deceased mayor. It is a given that media outlets will do all they can to get ahead of others in running a story (e.g. “You got it here first!”). The competition had become fiercer nowadays because of the social media, where sites such as Twitter are used extensively for disseminating breaking news. Prior to serving in the cabinet of President Benigno Aquino III, the late interior secretary Jesse Robredo earned national and international recognition for his leadership of Naga City, the capital of Camarines Sur province. Robredo served as mayor for six non-consecutive terms, or a total of 19 years. His stint in public office, however, has not been free from controversy. Two weeks before the May 2007 elections, elements identified with the camp of Camarines Sur Rep. Luis Villafuerte tried to have then-Naga City Mayor Jesse Robredo disqualified from seeking reelection because of citizenship issues. 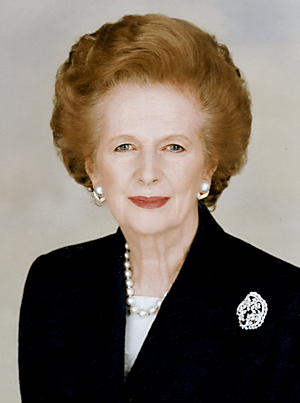 Tributes for the late secretary will certainly dominate the headlines in the days to come, but this is one event that should not be forgotten. Villafuerte served as president of Kabalikat ng Malayang Pilipino (KAMPI) until it merged with LAKAS-CMD (the other dominant administration party at that time) in May 2009. Then-Senator Gloria Macapagal-Arroyo formed KAMPI in 1997 as a launching pad for a potential 1998 presidential bid (she ran and won as the running made of LAKAS-NUCD standard-bearer Jose de Venecia instead). Robredo was so convinced that the Commission on Elections will rule against him that he persuaded his wife to run for mayor as well. The other candidate for the position is Jojo Villafuerte, a nephew of the elder Villafuerte. The move to have Robredo disqualified from the race gained greater national attention after former president Corazon Aquino and erstwhile members of the Arroyo cabinet announced their support for him. Aquino went on to describe Robredo as “one of the best mayors (the Philippines) has ever had,” adding that all mayors should be like him. Despite the citizenship issue, Robredo handily won reelection that year, winning by more than 40000 votes. 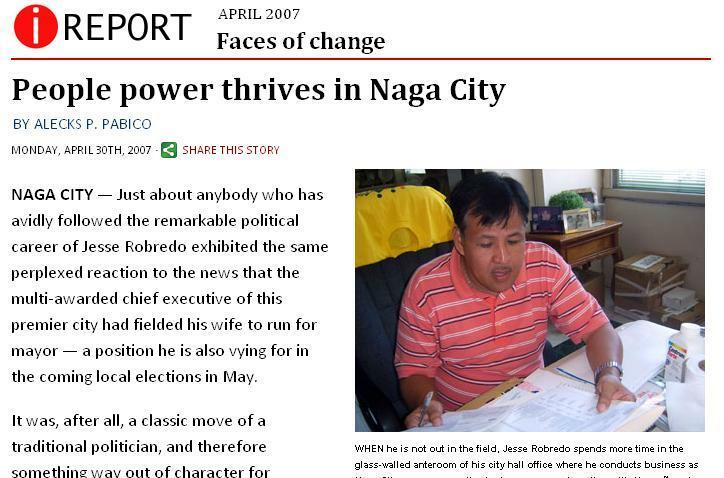 Same as in 1998 when he first became term-limited, Robredo did not field a relative to succeed him as mayor. In 2007, Philippine Center for Investigative Journalism’s Alecks Pabico quoted Robredo to have said: “Not a relative, not my wife, not anyone who has blood relations with us (will take over my post).” At age 42, Robredo received the coveted Ramon Magsaysay Award for government service in August 2000. Robredo was awarded Asia’s Nobel Prize for “giving credence to the promise of democracy by demonstrating that effective city management is compatible with yielding power to the people.” Robredo, the citation also states, “demonstrated that democratic government can also be good government.” Looking back now, the attempt to engage an outstanding public servant like Robredo in political trickery definitely looks silly. The ones behind it should be ashamed of themselves. Robredo got embroiled in another controversy in 2010. 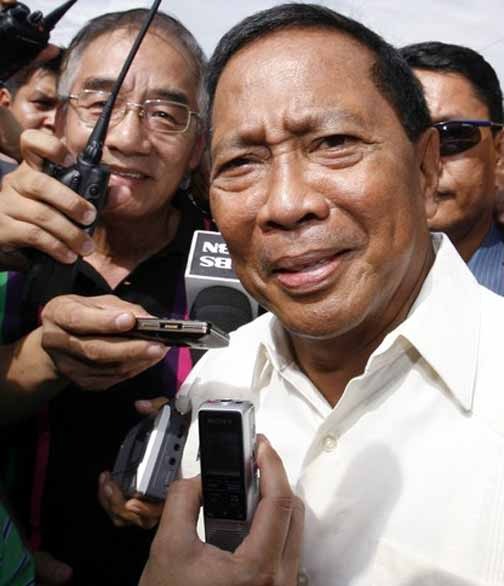 Shortly after being proclaimed as the Vice President, Jejomar Binay expressed his interest to be the interior secretary. Several individuals, most notably Solita “Mareng Winnie” Monsod, publicly dissuaded Aquino from appointing Binay. The outgoing Naga City mayor eventually landed the job, while Binay largely settled for the positions previously handled by Noli de Castro, his predecessor. Robredo is affiliated with the Liberal Party (or the Balay faction) while Binay is supported by the Samar group. Robredo and Binay have been able to co-exist peacefully the past two years. However, sometime last year, a public word war erupted between the secretary and Binay’s son Junjun (who succeeded his father as Makati Mayor) after the violent demolition of slums in Guadalupe Viejo, Makati. Dolphy was a good man who embodied the common Filipino: he loved deeply, knew the value of humor, respected his fellowmen, and was always ready to face any challenge life threw at him. He came from a generation that went through a lot of trials—and the struggle taught him to be humble, honest, and helpful. He never turned his back on his peers; he never turned his back on the people who had propelled him toward success. Throughout his life, Dolphy showed that hope and happiness always lie at the other side of adversity; he knew that any problem can be overcome through a positive outlook. He did not only revolutionize the entertainment industry; he also changed our national consciousness for the better: through his art, he extended our worldviews, and gave us the ability to reflect on, value, and find joy in the daily realities of Filipino life. I, along with my family and the rest of our administration, join the Quizon family in mourning. The passing of Rodolfo Quizon Sr.—our King of Comedy—is a truly sorrowful moment for a nation that, for so long, found happiness in his work. PS: President Aquino and Dolphy have had an interesting relationship the past two years. In 2010, Dolphy endorsed Senator Manny Villar, Aquino’s main rival for the presidency. The former even appeared in two television campaign ads for Villar. A few months after assuming office, Aquino bestowed on the Comedy King the Order of the Golden Heart. As Dolphy’s condition worsened in recent weeks, many personalities publicly called on Aquino to give the former the National Artist Awards, but presidential spokesperson Edwin Lacierda emphasized that it cannot be done because of the pending TRO against the conferment of such awards (this will be discussed at length in a future post). Comedy King Dolphy dies, 83. Dolphy, or Rodolfo Vera Quizon Sr., passed away Tuesday at 8:40 p.m., at the Makati Medical Center, thus ending one of the longest and most colorful lives and careers in Philippine show business history. He was 83 and about to turn 84 on July 25. This was confirmed by a close family member Tuesday evening. Dolphy died of chronic obstructive pulmonary disease. He also suffered from kidney ailments. Dolphy did this commercial for Dolfenal back in 2005. In an earlier report GMA News’ “24 Oras,” a son of the actor-comedian, Ronnie Quizon, said his father was suffering from chronic obstructive pulmonary disease (COPD), a condition which limits the amount of air that enters the lungs.